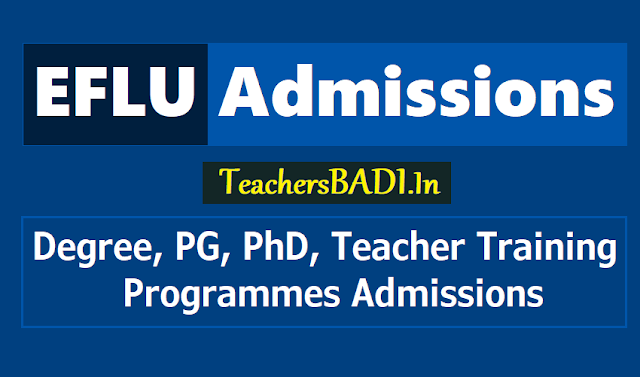 #EFLU Degree, PG, PhD, Teacher training programmes admission 2019/ IFLU Entrance Test 2019/ IFLU CET 2019/ IFLU UG, PG Courses admissions 2019/ admissions @ efluniversity.ac.in: The English and Foreign Languages University(IFLU) has given Degree, PG Programmes admission notification and Online applications are invited for admissions to the UG, PG, Teacher training and Ph.D. programmes at English and Foreign Languages University for the academic year 2019-2019. 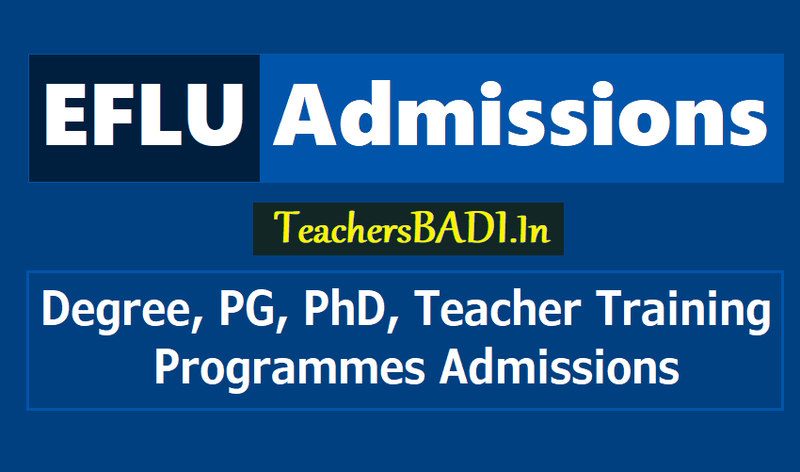 EFLU, Hyderabad Post Graduate Certificate Course, UG, PG Courses : The English and Foreign Languages University, Hyderabad invites applications for admission to the following distance mode programme and invites online applications for admissions to the following courses and programmes at Hyderabad, Lucknow, and Shillong for the academic year 2019-2020. 1. U.G. Courses: B.A. (Hons.) English; Arabic; French; Japanese; Russian; Spanish; German; B.A. Journalism and Mass Communication. 2. P.G. Courses: M.A. English; Journalism and Mass Communication; Computational Linguistics; English Literature; Linguistics; Literatures in English; Comparative Literature; English Language Teaching; Hindi; Arabic Language and Literature; French Language and Literature; German Language and Literature; Russian Language and Literature; Hispanic Language and Literature. 3. Teacher Education Courses: P.G. Diploma in the Teaching of English (PGDTE); B.Ed. English; P.G. Diploma in the Teaching of Arabic (PGDTA). 4. Ph.D. Programmes: Ph.D. Linguistics and Phonetics; English Language Education; Education; English Literature; Translation Studies; Comparative Literature; Indian and World Literatures; Aesthetics and Philosophy; Film Studies and Visual Culture; Cultural Studies; Arabic Language and Literature; French Language and Literature; Russian Language and Literature; German Language and Literature; Spanish Language and Literature. Eligibility: Intermediate/ 10+2, Bachelors/ Masters degree, PG Diploma/ Certificate, M.Phil. Eligibility: M.A. in English or in an allied subject (Linguistics, Education, Mass Communication, Psychology or Critical Humanities/ Liberal Arts). B.A. (Hons.) English; B.A. (Hons.) Arabic; B.A. (Hons.) French; B.A. (Hons.) Japanese; B.A. (Hons.) Russian; B.A. Journalism and Mass Communication. M.A. English; M.A. Journalism and Mass Communication; M.A. Computational Linguistics; M.A. Hindi; M.A. Arabic; M.A. French; M.A. German; M.A. Russian; M.A. Spanish; M.A. English Literature; M.A. Linguistics. Post-graduate Diploma in the Teaching of English; B.Ed English. Ph.D. Linguistics & Phonetics; Ph.D. Education; Ph.D. English Language Education; Ph.D. Aesthetics & Philosophy; Ph.D. India Studies; Ph.D. Indian & World Literature; Ph.D. Film Studies & Visual Culture; Ph.D. Hindi; Ph.D. Cultural Studies; Ph.D. Arabic; Ph.D. French; Ph.D. Russian; Ph.D. English Literature. The fee can be payable through Credit card/debit card/Netbanking. Filled in application form along with the two Demand Drafts may be sent to the The Dean, School of Distance Education, The English and Foreign Languages University, Hyderabad. For more details at IFLU Website. Candidates admit pass will be available for downloading on the University’s website, http://www.efluniversity.ac.in, after you have successfully submitted your application form and paid the entrance test fee. The admit pass will not be sent by post. Therefore, Make sure you download it and print it out before you appear for the test. 1. Last date of receipt of applications: 07 to 26.02.2019.